Virtual reality has come to Apple’s computers, in a fashion, with a new app which lets Mac owners experience macOS as a virtual desktop using an Oculus Rift headset (the developer version, mind you). 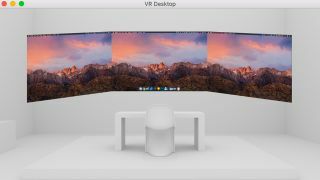 Produced by Cindori, the VR Desktop app essentially allows you to experience your desktop as a giant screen – or rather, up to three of them, in multi-monitor fashion – with various possible use cases. For example, the simple productivity boost of using three (huge) displays for multitasking – with no extra monitors needed, or indeed no display at all save for the headset – with the software allowing you to adjust the size and positioning of these virtual screens. Or you can experience games on a giant curved screen, the developer boasts, or indeed watch movies for a truly immersive experience. To successfully run the app, you’ll need to own an Oculus Rift DK2 (dev kit version, not the commercial release) headset and a Mac with a discrete GPU (some graphics grunt is obviously required, and integrated won’t cut it) running macOS 10.11 or better. If you qualify on all those counts and want a piece of the virtual desktop action, the software will set you back $20 (around £16, AU$26). Support is planned for the commercial version of Oculus Rift and the rival HTC Vive headset, and it’ll arrive as soon as these devices support the Mac platform, the developer notes, adding that HTC will apparently be doing so in the first half of this year.